An emergency alert system that is supposed to warn Great Lakes communities of toxic spills from Canada’s Chemical Valley is outdated, overly complicated and often useless in giving Michigan coastal cities timely notice of an environmental threat. Michigan officials say hours can pass before they are told of oil or chemical spills into the St. Clair River. Given the river’s swift current, a delay of over an hour from the Sarnia, Ontario facilities makes the warnings of limited value to coastal communities south of Port Huron, critics say. Officials overseeing the byzantine system concede that alerts sometimes pass through up to five government agencies in Canada and the U.S. before they reach cities and towns along a spill’s path. In addition, many of the roughly 60 factories within Chemical Valley announce spill alerts not through some high-tech form of automated mass communication. Rather, they alert Sarnia police through a relic of pre-9/11 technology: the fax machine. “A rat in a maze couldn’t follow the diagram that tells officials who to contact next,” Doug Martz, who served as chairman of the Macomb County Water Quality Board until it was disbanded in 2011, said of the Canadian warning system. 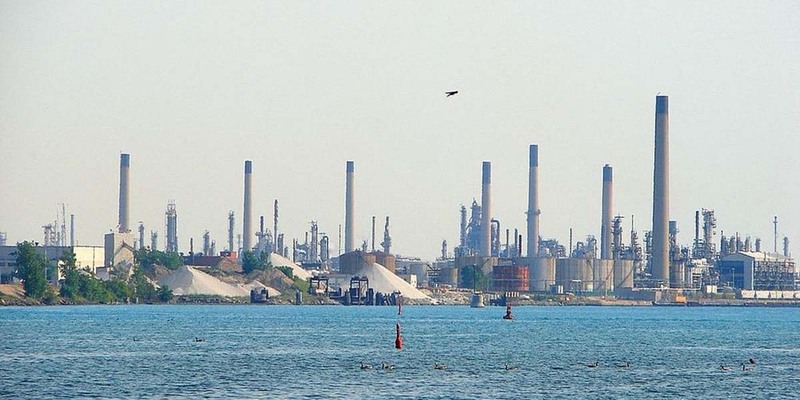 Oil and chemical spills from the Sarnia factories flow through the St. Clair River into Lake St. Clair and the Detroit River. What’s left of a spill would head further south into Lake Erie. A delay in reporting spills means the damage may have already been done by the time local health departments and drinking water plants in metro Detroit receive word of an accident. Officials on the U.S. side, mostly from St. Clair and Macomb counties, have registered complaints about Canada’s alert system for more than a decade following spills in 2004, 2011, 2012 and again last year. To this day, FAX machines are still used by 20 companies at Chemical Valley to notify Sarnia police and EMS about spills or air emissions that present a potential health hazard. From there, the Ontario Ministry of the Environment in Toronto is notified. That agency then warns Michigan State Police, which uses the computerized Law Enforcement Information Network (LEIN) to alert local police along with the state Department of Environmental Quality. DEQ say it then activates a warning network that spreads information from its Lansing headquarters to its southeast Michigan district office in Warren, which notifies local health officials if a potential public safety emergency is determined. Water plant operators are sometimes the last to know. Some recent spills have renewed concerns about the alert system. Bridge obtained descriptions of spill alerts since 2014 from Michigan DEQ and a bi-national committee that oversees environmental improvement efforts on the river. In April 2016, when Imperial Oil spilled an unknown amount of diluted hydrofluoric acid, a toxic substance that can poison people through exposure, into the St. Clair River, local officials on the U.S. side were not notified until about two days later. During another chemical release that same month from Shell Oil, the company’s phone line available for concerned residents was not in service. And an emergency number listed for a local Canadian fire department instead directed callers to an auto dealership in Omaha, Nebraska. Still, the Ontario Ministry of the Environment insists the notification system functions properly. “The ministry remains committed to ensuring timely notification to partners during emergencies and supports discussions between officials on our joint agreements to ensure this occurs,” said Lindsay Davidson, an agency spokesman. He did not comment on individual incidents. Beyond slow response times, internal documents reveal other shortcomings. In some cases, spill warnings never made their way to DEQ. Others did not include basic information such as the source of the leak, the pollutant involved, or the volume of contaminants released. Jeff Friedland, a St. Clair County official, said he relies on “a roller coaster ride of information sharing” from Canada that too often breaks down. Friedland serves as the county’s Homeland Security and Emergency Management director, a title that has varied a bit during his 26 years on the job. His county is situated on the front lines, about a quarter mile across the St. Clair from Chemical Valley. St. Clair County is home to several water plants from Port Huron south to Algonac, where the river flows into Lake St. Clair. Given the “history of events” impacting downstream communities, Friedland said the region faces as much of an environmental threat as anywhere in the Great Lakes basin. After years of trying to establish better communication with factories and government officials across the river, Friedland said he accomplished a breakthrough earlier this year: Shell and the Sarnia Police Department agreed to put him on the list of those notified immediately when a spill occurs. Officials in downstream areas of Macomb, Oakland and Wayne counties are not on that list. They still rely on a bureaucratic chain of government alerts before they are told about possible threats to public health. Comprehensive look at a problem that should not exist. An agreement should be reached that spill notifications go out simultaneously, not seriatim. Such an agreement would require the Canadian government to surrender its monopoly on distribution of information, however. This is the whole problem. If a Corporate Executive, Board member etc, should knowingly cost the corporation value they are breaking Canadian Corporate Law. To report an “incident” is to subject the corporation to penalties and fines that can and will impact the value of the corporation so it would be breaking the law to report. Self reporting, policing and approving must be out of government and industry hands and into unbiased Scientists, Analysts and professionals. The toxic spills into the river are random. The discharge of airborne particulate is constant. That the elephant in the room. Sarnia has the worst air quality in the entire country of Canada. Let's talk about the real issue. Why are the spills happening in the first place? Canada needs to clean up chemical valley. This has been going on for years. They should not be able to endanger people’s lives. And now they want to bury nuclear waste by the water and we should trust them. They need to mandate large fines on these companies. And clean up this mess. Kim, the spills are happening because there has never been an effort by government to make industry comply with existing standards. It’s not Canada, it’s Ontario that has jurisdiction over pollution legislation and regulation. If “They” mandated large fines against these corporations the corps would just factor these costs into the price at the pump. We’d pay the fines. Finally buried nuclear waste has been happening at the Bruce Nuclear site since the 80’s. The issue of the day is “they” are going community to community offering money to let the government bury the waste in deep geological repositories and trust the government scientists that the repositories will hold the contents for millions of years. I am from Aamjiwnaang and we have Bruce to our north and Chemical Valley as our next door neighbour. You have every reason to feel afraid.